The Palmetto 200 is an overnight relay that covers roughly 200 scenic miles of the lowcountry. This years Palmetto 200 relay starts April 30th, with the starting times staggered based upon each team’s estimated finish time. 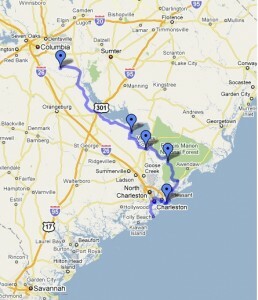 The relay starts in Cayce, SC which is near Columbia and ends in our own Folly Beach. Highlights of the run include the Francis Marion National Forest, Charleston itself and of course the welcoming landscape of Folly Beach. Participants are estimated to begin arriving at Folly Beach around noon on Saturday, May 1 and continue streaming in through the afternoon. Incase you are wondering the Palmetto 200 is open to everyone! While serious racers are welcome and will participate, the casual jogger will have just as much fun. Simply register with your team’s estimated pace to make sure you arrive at the Folly finish line during the afternoon of May 1. The Palmetto 200 and those who participate support the Cannon Street YMCA, with the goal of connecting individuals, families and communities based on Christian values that strengthen spirit, mind and body.